Scarsdale Little League (“SLL”) currently is the largest youth athletic program in the Village of Scarsdale with children in grades K through 8 participating in the league’s Spring, Summer and Fall in-house and travel programs and its “Winter Workout” programs for players in 3rd through 8th grades. The league is administered by a 15-member board of directors composed entirely of parent volunteers. The full board and its various committees meet throughout the year and spend, collectively, thousands of hours each year designing and administering the league’s various divisions and developmental programs. Each year, the board invites parent volunteers to manage the league’s many teams and to serve as coordinators responsible for all teams in a particular grade or division. The board also retains a limited number of professional coaches each season to manage a number of more competitive travel teams organized by the league for the 4th through 8th grade players. The league has a broad mission, which includes serving all school-aged children in K through 8th grade who wish to play baseball and whose skills and focus range from the recreational level through the competitive travel level where Scarsdale teams play teams of similar skill from other towns in Westchester and other nearby areas. SLL’s goal is to continually improve these programs through analysis of our successes and areas requiring improvement each season with particular reliance on feedback from grade coordinators, coaches and parents. However, if there is a common goal that motivates all board members and parent volunteers, it is the desire to promote the development of baseball skills, emotional growth through a team baseball experience and, ultimately, a love of baseball itself. Currently, the league’s Spring program, which is its primary season, is organized into single-grade leagues from K through 3rd grade. The distance between bases is 50 (K and 1st grade) and 60 feet (2nd and 3rd grade) with the pitcher's mound 42 feet from home plate. Players are placed randomly on teams following registration. Teams are organized by elementary school. Players are placed randomly on teams following registration. Teams are organized by elementary school. After the season ends, players are rated by their coaches, and those ratings are used in conjunction with independent evaluation data held each Fall for 3rd through 8th (“Fall Evaluations”) in the following year's team formation process to promote balanced teams. Teams are formed using an algorithmic-style “draft” using SLL coach ratings, independent Fall Evaluation data and various metrics in an effort to create the most balanced teams possible across the league. After the season ends, players are rated by their coaches, and those ratings are used in conjunction with independent Fall Evaluation data in the next year's team formation process to promote balanced teams. Teams are mixed (i.e., not by elementary school); however, balance across the five elementary schools is a goal in team formation. It has been extremely rare historically; however, there is the possibility that a "baseball" age 9-year old 3rd grader who takes part in the independent Fall Evaluations and receives very high marks could be invited to play in the Pacific or Atlantic leagues. While SLL technically forms teams by Little League age (“baseball” age) rather than by grade in order to conform to the rules of Little League Baseball, the governing entity with which SLL is affiliated, by and large the leagues are grade-based as described below. An age-based structure has been demonstrated to be a more successful construct for skill development, competition and safety.​ Please see the "Baseball" Age Determination section at the bottom of this page. 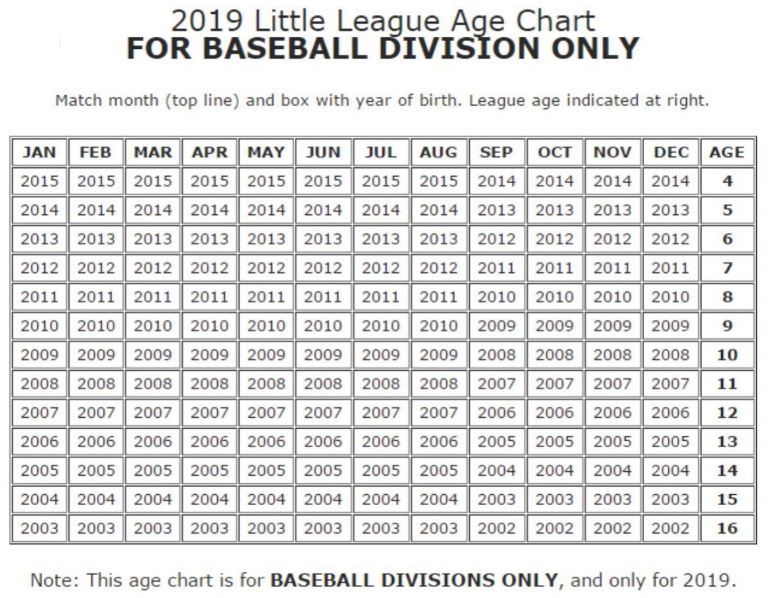 Players with "baseball" ages of 9-12 (traditionally, 4th through 6th graders) are organized into two leagues known as the Atlantic and Pacific Leagues. The distance between bases is 60 feet with the pitcher's mound 46 feet from home plate. Pacific Division includes all players of "baseball" ages 9 through 11 (primarily 4th graders with some 5th graders) who either did not attend the independent Fall Evaluations or are not invited to play Atlantic. As noted, it is very rare for a 9-year old (3rd grader) to play in Pacific. Atlantic Division is SLL’s most-competitive division and includes players of "baseball" ages 9 through 12 (mostly 5th and 6th graders) who attended the independent Fall Evaluations and are invited to play in Atlantic. Please note that all those of “baseball” age 12 are automatically eligible to play in Atlantic (primarily 6th graders, but in some cases are 7th graders). Atlantic has mainly been made up of players in 5th and 6th grade. It is rare for a player with a “baseball” age of 10 (4th grader) to play in Atlantic. After players are assigned to either Atlantic or the Pacific Divisions, teams are formed using an algorithmic-style “draft” using SLL coach ratings, independent Fall Evaluation data and various metrics in an effort to create the most balanced teams possible in Pacific and Atlantic. After the season ends, players are rated by their coaches, and those ratings are used in conjunction with independent Fall Evaluation data in the next year's team formation process to promote balanced teams. Teams are mixed (i.e., not by elementary school); however, balance across the five elementary schools is a goal in team formation. All players with "baseball" ages of 9-12 who wish to play in the more competitive Atlantic Division and/or on a travel team MUST be evaluated in the Fall by third-party, independent evaluators (currently, from the Hardball NY organization) in the areas of hitting, infield, outfield, pitching, catching and running. SLL coach ratings and the independent Fall Evaluation data are utilized to assign players to an appropriate division. Please note that beginning in the Fall of 2018, 3rd graders have been evaluated in an effort to create more balanced teams in the 3rd grade league (see the 3rd grade section above). Travel teams players in 4th through 8th grades will consist of between 12-14 players selected based on the independent Fall Evaluation results. All travel players in 4th through 6th grades MUST play on an Atlantic League or Pacific League team in addition to their travel team and must attend their Atlantic or Pacific League games each week to be eligible to play in their travel league games for that week. Normally, Scarsdale Little League's travel program fields grade-based teams for the 4th, 5th, 6th, 7th, and 8th grades, all of which will be entered in age-based (at the 10U (i.e. 10 and under), 11U, 12U, 13U and 14U levels) Westchester County travel leagues (WBA/RBA and/or GHVBL) whose member teams are primarily from Southern Westchester, the Bronx and NYC. There is a high correlation between grade levels and ages, and SLL has found that grouping players by grade for travel teams results in a more enjoyable experience for the players. Assignments to Scarsdale travel teams occur after Fall Evaluations and are based on evaluation results. Travel teams require a higher level of commitment than teams in SLL’s in-house leagues. Those who are invited and accept a spot on a travel team are expected to attend practices and games and also must play in our SLL in-house Spring leagues and attend all in-house games. Those who have regular conflicts with travel practices or games should consult the SLL before registering for a travel team. As for the location of games, in past years many travel teams from other towns have been club teams without reliable access to their town fields, so more games than usual have been played in Scarsdale. We are not certain whether that will be true this year, but at this time we expect that trend to continue. SLL’s smaller though successful Summer and Fall programs are organized each year and provide an out-of-season and fun experience for players and coaches alike. Those who would like to learn more should reach out to SLL. Please see the Little League International Age Chart below to determine a player's "Little League Age."